When you’re building a custom home from scratch, it’s only natural to want to add things to the project. “While we’re at it” becomes a familiar refrain, and before you know it, that little project has grown. That wasn’t the case for a vacation home on Lake Superior. 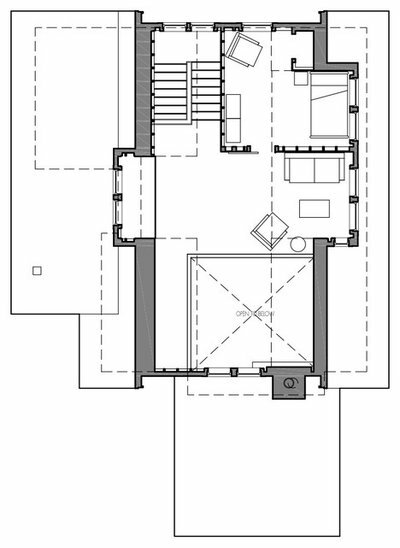 With every iteration of the plan, the house became smaller and more efficient. For the owner, a semiretired physician living in St. Paul, Minnesota, less was definitely more. 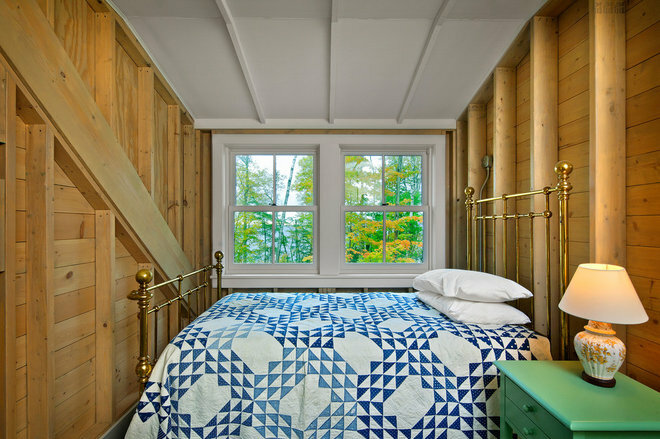 She had happy memories of summers spent at a rustic cottage in Maine, and wanted to capture that same feeling in her new retreat. She insisted on just a single bath and less insulation than the norm, so that the 1,500-square-foot home provides just enough shelter from the elements to be comfortable. 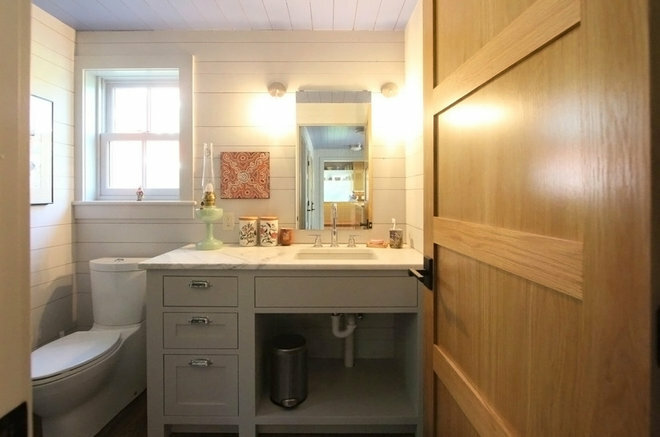 That’s interesting: The bunk room above the garage contains 4 beds for overflow guests, but the county wouldn’t allow a composting toilet there, so an outhouse was added out back with the county’s blessing. The homeowner was wary of building anything too fancy. “She wanted it to feel very simple and relaxed,” says architect Christine Albertsson of Albertsson Hansen Architecture in Minneapolis, who collaborated on the home with project manager Mark Tambornino. Albertsson collaborated with the homeowner on the interiors, using mostly furniture the owner already had, like a pair of slipcovered linen sofas (now discontinued) from Room & Board. The floors throughout the main level are reclaimed elm. Despite the seemingly grand size of the living room, the house is actually fairly small, with most of the floor space dedicated to communal living. Exposed studs are occasionally commandeered for storage (as seen behind the sofa), although their erratic nature is revealed here, too. 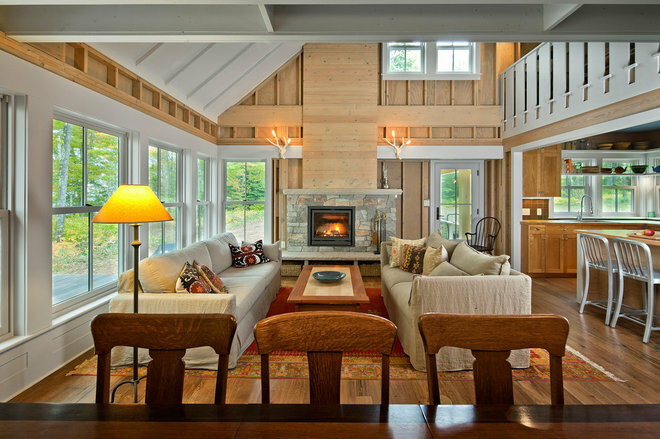 In keeping with the home’s rustic spirit, no drywall was used inside. 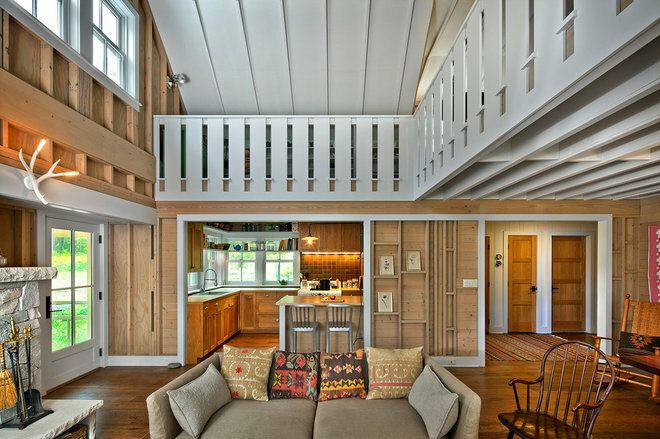 The ceiling is painted plywood; horizontal bars protrude from the railing below, denoting the edges of the loft floor. The elevated slab hearth is a signature for Albertsson, who likes to use the space underneath a fireplace as storage for paper, kindling and games. 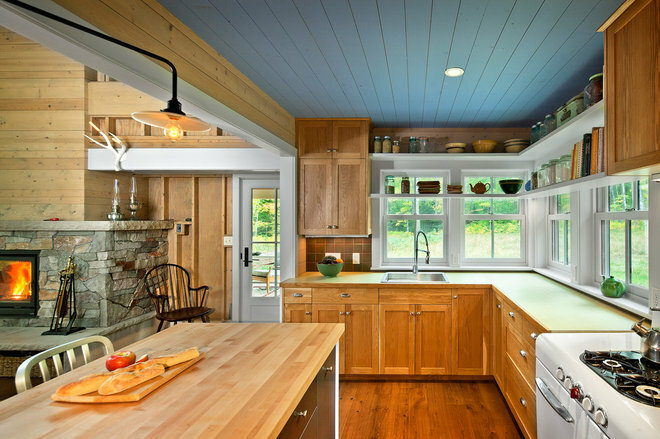 The client didn’t want the kitchen to be “too precious,” Albertsson says. To give it a casual feeling, she mixed oak cabinets with metal-front units from Ikea, and used plastic laminate counters around the perimeter. “We wanted it to look a little thrown together,” she says. A shelf across the windows maximizes storage and adds a playful note, as does the swiveling light illuminating the peninsula. The vintage range sat in the owner’s garage for years before she found a place for it here. The wall studs and sheathing were treated to a translucent white stain, to prevent the interior from looking too yellow. Printed milling marks were left on the wood, for a casual look that seems to suit Eli the cat. The home’s sole bathroom sits on the main floor and includes a generous walk-in shower clad in black slate. When the masonry gets wet, it emits a distinctive fragrance. “You really feel the presence of the stone,” Albertsson says. The window seat in the upstairs loft can double as a bed, although Cooper seems comfortable on the carpet. The floor surrounding the carpet is painted plywood. There’s a small TV viewing area in the corner behind us in this view, as well as a sliding barn door that leads to the second bedroom. The second bedroom is furnished with a brass bed that the owner inherited from her grandmother. 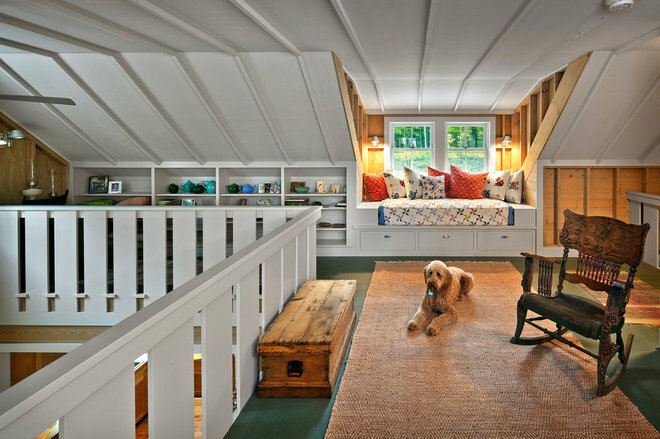 Happily, it fits perfectly inside this roof dormer. The house and barn were built in quick succession, but were designed to look like the property had evolved over time. (The contractor was Leafblad Construction.) The barn was completed first, to provide a staging area for construction of the main house and a secure tool-storage place. When it’s sunny, the solar array on the roof provides enough electricity to power the house. Composition shingles were used elsewhere on the home to save money. 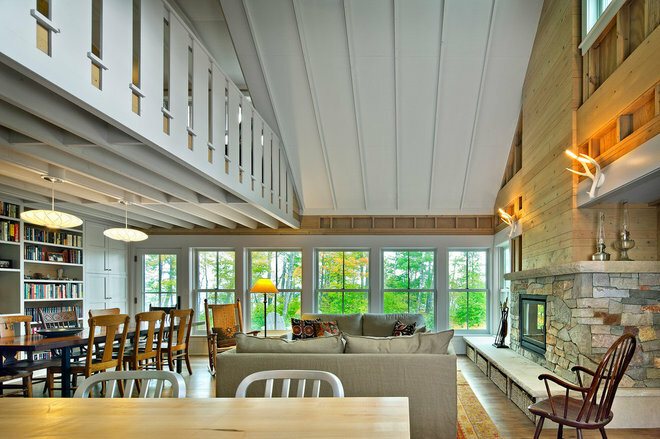 The mix of roofing materials felt compatible with the home’s thrown-together look. The homeowner bought the 9-acre parcel from the woman next door, who is an old friend. Since the neighbor has multiple sclerosis, the house was designed to be handicap accessible, to accommodate her visits. Madeline Island is reachable by ferry in clement weather. When the lake freezes over, visitors can drive to the island on an ice road, which is lined with evergreen boughs to mark the route. “It gives a feeling of being a world apart,” says Albertsson. The first floor. 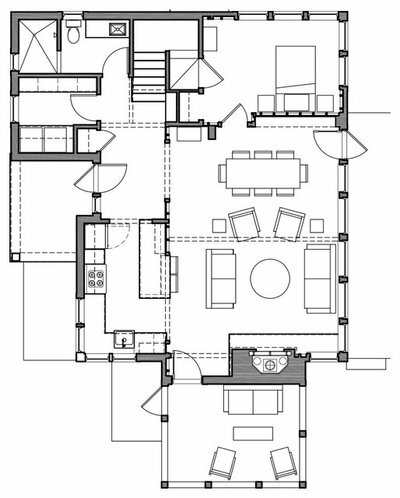 In keeping with the home’s close-to-nature theme, the screened porch (at the bottom of the plan) is exposed on three sides, while windows line the living room and bedroom walls behind it. The second floor. With the two bedrooms, the bunk room and various sofas, the house can sleep up to nine people at one time. “But it still maintains its identity as a very modest little cabin,” Albertsson says.